Hey everyone! It’s Finance Fridays and this should be a short post about Taxes and Tax Withholding. I was wrong. Not by a horrible amount… but still wrong. This reminded me of something that occurred to me during my transition from fellow to attending. As a fellow you probably make like $50k or $60k or so, Jan-July. Then as soon as you start working as an attending in July, you begin making “attending money” July -January. I refer you to my The Biggest Mistake of Your Life post, to remind you of the importance of maximizing your 401k during those 6 months, and 457 if available to you. Make sure you take into account any money you put toward a Roth 401k/403b in Residency, so that you don’t overcontribute. What changes during that transition? Well, mainly, you transition into a new tax bracket. 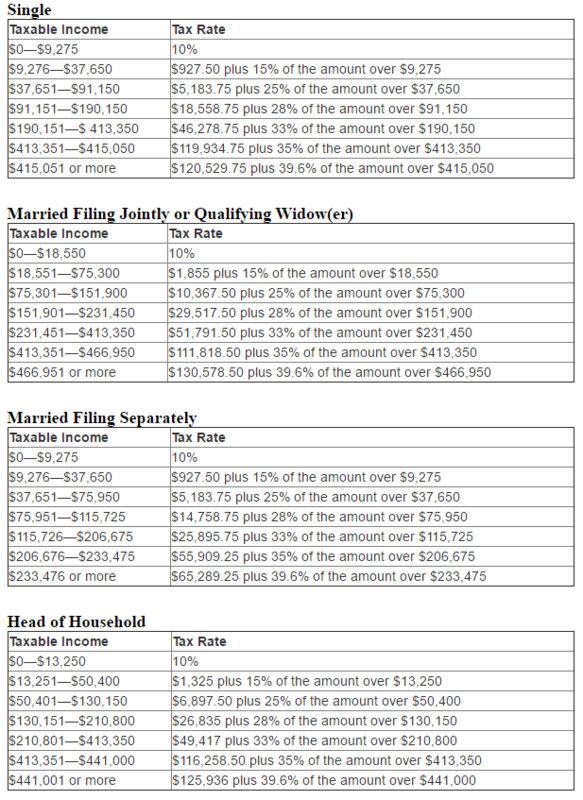 Remember that picture from Roth 401k/403b in Residency about the marginal tax brackets? No? It’s ok, here it is again. So during that first year out, you will make $25k as a fellow (1/2 year) and $110k from as an attending (1/2 year). So you go from making ~$50k to making ~$135k in terms of income for that tax year. So the deal is that you will be in a different tax bracket for that year, but because your new job assumes you will make $220k, it will withhold more money than it needed to… because in reality you will only make $135k. Additionally, you will have paid more than your share of Social Security, since you will have paid some of it as a resident, and then again as an attending. All things considered, you should get a refund back. The likelihood is that if you were single, you choose a tax withholding of 1, or 2 if you are married and are soul income earner. Well, remember what I said the certainties of life are Death, Taxes and Student Loans. You probably chose your withholdhing as a resident and were told to put either 0 or 1, which you may have forgotten about it by now. The long and short of it is, your employer will hold some of your salary for you in order to pay that toward the federal (and state) government for income taxes and Social Security. The full definition is here, for those interested. I see.. so I get a refund then? Sounds good to me… so what’s the problem? It’s not necessarily a problem, but the following year, you actually will make the $220k during your first full attending year. If you chose the appropriate withholding above, then you’ll probably be right around the mark. However, here is where things kind of get a little confusing. Remember how I talked about Why Do Doctors Marry Other Doctors? Well, for those couples that are both physicians, a similar situation will happen. However, it will be a jump from making $100k combined to making $270k combined for that 1st half year as attendings. This places you in a higher tax bracket (see above). Even so, you will probably still get some sort of refund that first year. The real problem is your first full year as attendings. You made $100k combined as fellows, but this first full year you will make $440k combined. If you refer to that chart above again, your tax bracket has changed once again. If you kept the same withholding as the prior year, you will likely owe a good amount in taxes, probably in the range of $20k or so. This is not a fun surprise to have at the end of the year. Ouch, how can I prevent this? It’s kind of hard to estimate taxes on the fly because it is dependent on your Adjusted Gross Income (AGI). This is different depending on whether you both maxed a 401k/403b and 457 and any other tax deductions you may have received. For example, home mortgage interest paid, student loan interest paid, moving expenses, professional expenses (CME, Boards, Dues, etc. ), etc. With all these variables, accurately estimating your withholding is difficult without some help. I don’t understand, why would my withholding be so far off? Well, I can’t say for sure, I’m not an enrolled agent, Certified Public Accountant (CPA), or other tax professional. Obviously, that isn’t enough withholding when it comes to tax time at year’s end. I see… did this happen to you? Yup. And it’s happened to a few of my friends too, the ones who are both doctors and then experience a jump in salary from residents/fellows into attendings during the same tax year. In fact, my colleague in Rhode Island even warned me this would happen when I started, although he couldn’t explain why. He said it took a few years of them working the same jobs to figure it out. However, I was busy with other stuff, so I forgot about it… and so yea, I owed a lot of money that one year. However, that isn’t necessarily a bad thing. It isn’t a bad thing? What…? Isn’t getting money back better? Not necessarily. You’ve basically just given the government a no interest loan of your money until they give you the refund. Then, you have to claim the refund on the following year’s tax returns because it’s considered income that wasn’t taxed yet. For some, they may be a little more zealous with their withholding and simply go into tax season knowing that they will probably owe money. Those particular individuals are prepared to pay when the tax man cometh. However, for me, I prefer to be right around $0 if at all possible. Two or three thousand one way or the other is comfortable to me. Your taxes will change from resident/fellow to attending. You can expect a refund during that first 1/2 year as an attending. However, the first full year as an attending, it’s a good day to approximate your taxes ahead of time. This is especially true if both you and your spouse are doctors who made the transition from resident/fellow to attendings during the same tax year. In my opinion, you really don’t want a huge refund or to have to pay a huge amount. The goal is to be right around $0 if at all possible… but two or three thousand one way or the other is what I consider “comfortable”. Just remember, I’m not a tax professional, this is just my experience. If I had a CPA to help me during my transition period from fellow to attending, he/she probably could have approximated my withholding for me. That way I wouldn’t have had a heart attack during the first full year that my wife and I made attending money. This is another reason why I think you should have a CPA do your taxes for you.